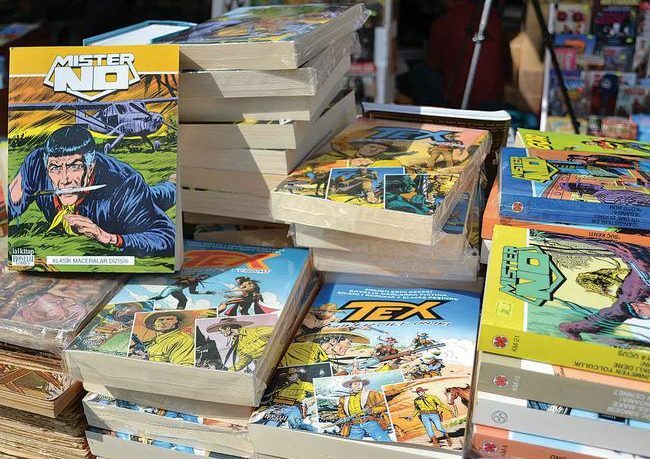 Comic strips that were followed with interest from the 1930s to the 1990s in Turkey meet with readers again at the 11th Beyoğlu Bibliopole Festival, organized by the Beyoğlu Municipality. Even though they are sold at reasonable prices, some rare pieces find buyers for astronomic prices. Comic strips that have been turned into screenplays with million-dollar budgets especially draw great interest at the festival. İlker Özer, who hosts book readers in one of the booths at the festival said he is interested in comic strips of various genres and has joined the festival for the ninth time. Özer said old comic strips have recently been reprinted and play a big role for children to become accustomed to reading books. For beginners, he said he recommends “Texas” and “Captain Miki” among old comics and “Spiderman” and “Batman” among new ones. ”Here we make people have nostalgia. We want them to meet the books from their childhood. We have customers who collect these books. We try to support their archive,” said Özer, stating comic strip series and humor magazines from the 1930s are sold at the festival. “For example, for a volume of Zagor published in the 1970s, it is nearly 600-700 Turkish Liras. For six volumes of Zagor from the 1960s, it is about $10,000. We cannot find them. That is why they are expensive,” said Özer regarding the price of the comic strips. Nurtap Emir from the comic bookstore 40 Ambar said she sells Italian, American and French as well as Turkish comic strips from the 1940s at her booth. Emir said she has joined the festival for 10 years. “My major study is on comic strips. I have been interested in them since my childhood and I am also a collector. Thanks to these festivals, we gain new collectors. I serve as a consultant for many people. I allow them to use my archive,” she said. Emir also said Italian comic strips are popular. The festival will continue until Oct. 2.